Welcome to Anime Secret Santa, a gift exchange, run by our friends at Reverse Thieves, where the gifts are anime review recommendations. We'll be publishing our reviews throughout the day on Christmas Eve. 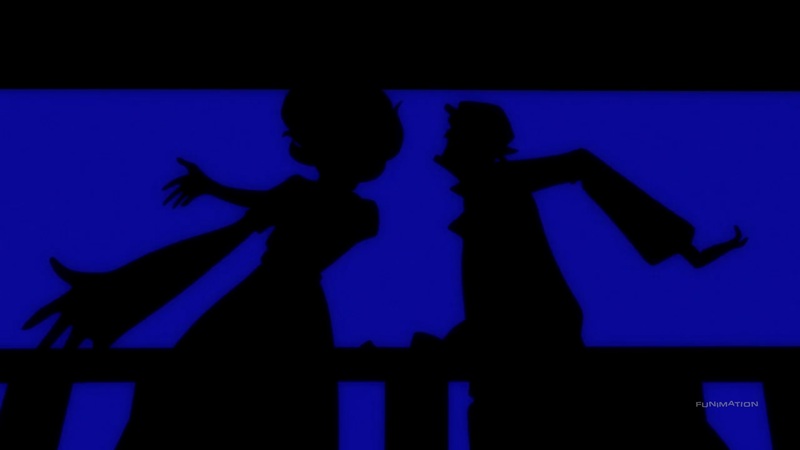 It’s a bit odd that, given my inclination towards noitaminA programming and outright love for works in which Masaki Yuasa has a hand, I never finished The Tatami Galaxy . When it aired in 2010, I remember re-watching the first episode multiple times but being unable to keep up with the rapid-fire dialogue well enough to make any sense of the story. Ultimately, I ended up putting the remaining episodes on what would turn out to be perpetual hold. Since then, I’ve steeled my subbed anime watching aptitude by consuming several simulcast titles per season … every season. So it is with renewed faith in my subtitle reading capabilities that I must thank my Reverse Thieves Secret Santa for noticing a gap in my viewing history that desperately and definitely needed to be rectified. A university student, longing for the love of a(ny) “raven-haired maiden” and the unhindered possibilities of the “rose-colored campus life,” finds his fate inexorably linked to despair via a black thread named Ozu. No matter which school club the unnamed protagonist’s freshman self chooses, however, Ozu remains the only bridge across the stagnant river of introversion and ultimately represents the sole available path forward (albeit inevitably to perceived regret). There are two ways to my metaphorical heart regarding drama production: unflinching amounts of tightly written conversational (intrapersonal or interpersonal) dialogue or showing everything competently via visuals and little else. Anything in-between instantly puts me on the defensive. With the former in mind, let me say that if John Moschitta Jr. narrated an anime written by an early Kevin Smith, The Tatami Galaxy would be it. Save eye-of-the-storm respites wherein viewers are allowed a second or two to focus on some beautiful image — be it abstract, metaphorical, or slice-of-life — the dialogue is nearly entirely nonstop. Pseudo-philosophical waxing and friendly banter encourage inquisitive ears and evoke good chuckles every now and then. But stop to look up at what’s going on behind the subtitles during an exchange, and at least part of a line if not an entire discussion will fly by. Luckily, speedreading may not be a requirement. 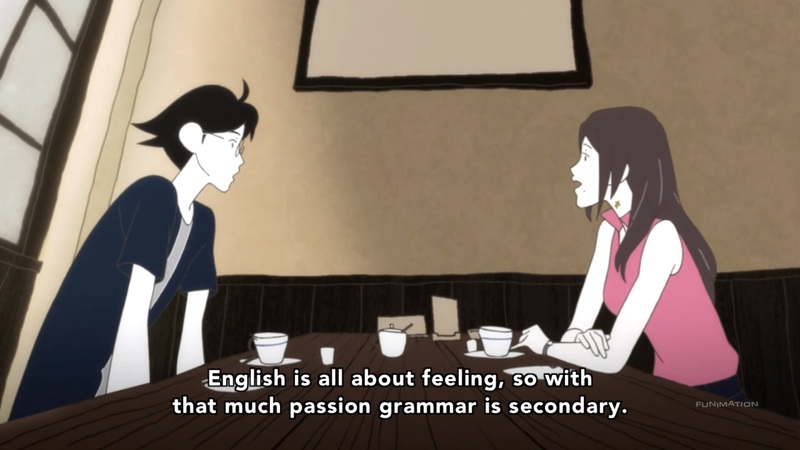 I've heard some say the narration and exchanges in The Tatami Galaxy are done in a hard-to-follow speed to limit the importance of immediate verbal comprehension and force a more general focus. If a rewatch is not in the cards, however, read the first epiode closely and subsequent episodes loosely; select scenes, like staple events in a timeline, repeat and therefore let your eyes take in what they might have previously missed. (Don’t get too comfortable though. Some subtle changes that occur for humor and story’s sake would be woefully lost to lax attention.) That’s not to say this is an Endless Eight situation — just variations on a theme with linking bits of (near-)identical dialogue and interactions with set dressing changes. Visually, I have nothing to complain about; this is a series that really fosters an appreciation for making effects look simple. Character designs are unique and expressive despite carrying just enough detail to be effective; faces are the focus of most of the effort, but the natural-feeling postures and movements are commendable. Most outstanding, however, is the way light, shadow, and basic colors are used to define sets. (Episode 5 is a great example of this.) Some scenes are more elaborate than others, but the simplicity of colors and shapes, combined with fantastic use of perspective, ends up producing superior executions in terms of visual impact. There are exceptions of course, like the run over the top of an inflated zepplin or fireworks bursting all around a young woman leaning against a tree, where the art and animation thaw the coldest of hearts. (If the FUNimation player used softsubs, I would worry for the amount of space on my external hard drive for all the screencaps I would have taken.) 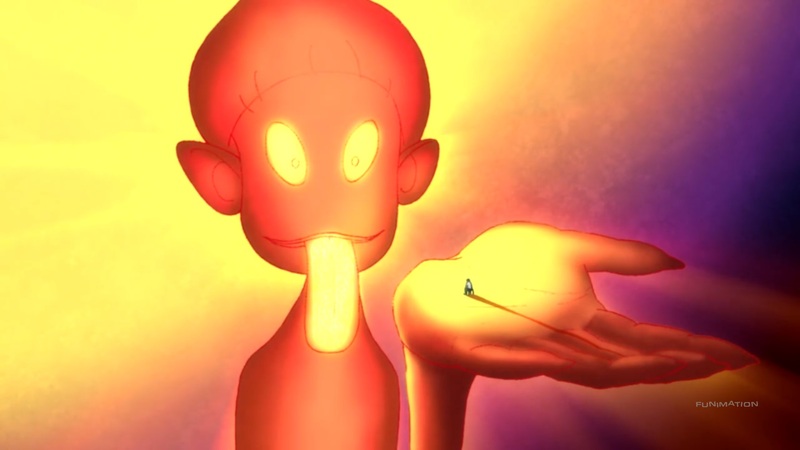 And thanks to some seriously good storyboarding throughout, visuals also excel at foreshadowing and metaphor. But what stands out most is the complementary, un-narrated synchonicity with the dialog and plot structure. As an example, I offer the scene at the end of almost every episode. 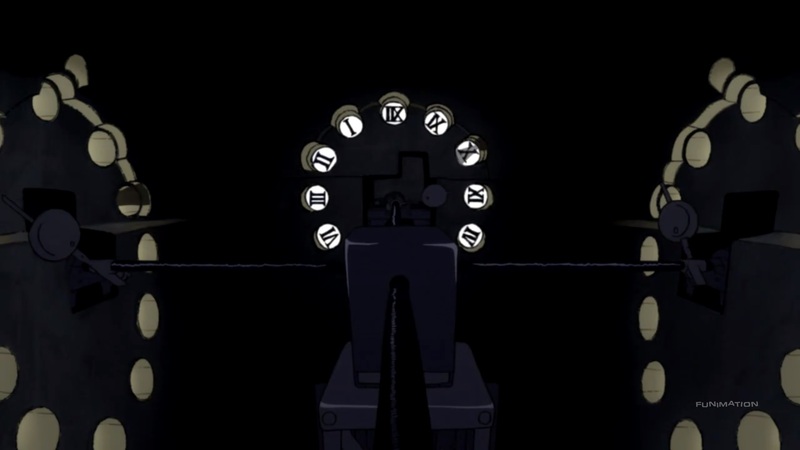 The end of each episode, which winds down to expose the machinations of a clock from behind its face, is rather brilliant for the application of its concise metaphor. Before the ending song rolls, the machinery of the clock whirs to life and sends the hands spinning, in kind, rapidly. This motion, presented as clockwise, makes sense given that, to the audience, this is how a clock moves: forward. But if you were to think of how this appears on the opposite side of the face, the hands are actually moving counterclockwise … backwards; time is being rewound. 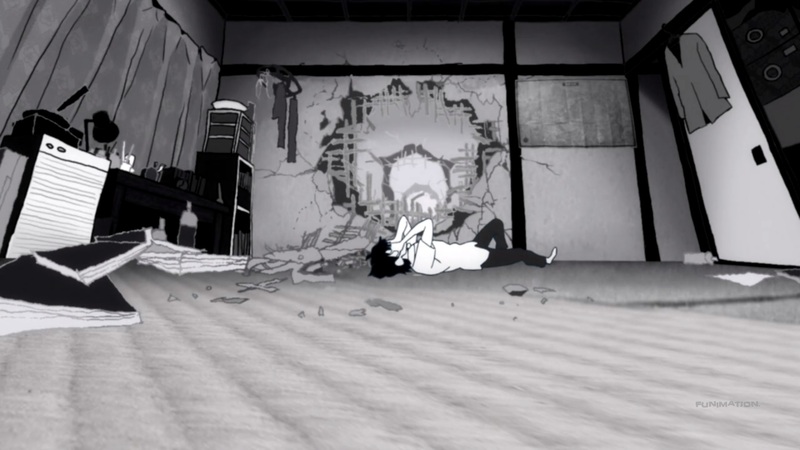 That visual, combined with the obvious super-fast rewind of audio and scenes from the episode, serve as a reset that lets each new episode retread the ground of the former episode but through a different course — a new club, one of the many possible paths the protagonist, as a freshman university student, can take to achieve his ideal outcome. All is not repetition, however, and the series, based on author Tomihiko Morii's novel, delivers a very satisfying end even though (or perhaps because) everything's not perfect. Some characters remember more than they should, and it's not exactly clear which events coincide with what versions of which characters, but all of the events that transpire during the eleven-episode run conspire, individually and collectively, to grow the protagonist in realistic if not relatable ways. This is a series about the paths we choose and who we become as a result, about living as opposed to hiding, and a reminder that the world of which we are all a part of is a wonderful mess of possibilities. This review is based on a FUNimation stream.